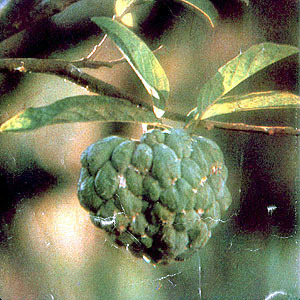 Atis – Scientific name: Anona squamosa L.
Small tree. 3 to 5 meters high. Leaves are hairy when young, oblong, 8 to 15 cm long, with a petiole 1 to 1.5 cm long. Flowers occur singly in the axils of the leaves, about 2.5 cm long, pendulous, three-angled, light green to yellow. Fruit is large, slightly heart-shaped, 6 to 9 cm long, the outside with polygonal tubercles. When ripe, the fruit is light yellowish-green, with a white, sweet soft and juicy flesh. The leaves yield an alkaloid, chloroplatinate. Seed yields an alkaloid, neurtral resin, fixed oil. Seed contains a yellow, non-drying oil and an irritant which kills lice. The leaves, fruit and seeds are vermicidal and insecticidal. The unripe fruit is astringent, used for diarrhea and dysentery and dyspepsia. Roots make a drastic purgative. Crush fresh leaves and place over nose. Pound and extract the juice from one unripe fruit and apply the juice directly on the infected bites, 3 times daily. (1) Shampoo hair with gugo bark or any commercial shampoo daily for one week; with “suyod” combing twice daily. (2) For lice eggs (nits), apply hot vinegar for half an hour after shampooing; then “suyod” (fine combing) thoroughly. (3) Bedtime, pound 1/2 cup of atis seeds and mix with 1/4 cup of oil. Apply mixture throroughly to the scalp and hair. Wrap the hair and head overnight. Shampoo in the morning and follow with fine tooth combing. Do daily for 3-5 days. (4) Paste of the crushed seeds in water, applied to the scalp. The same used as abortifacient applied to the os uteri. Eaten raw or makes a delicious ice cream. The fermented fruit used to make cider. This entry was posted in List of Medicinal Plants in the Philippines and tagged atis on March 6, 2009 by Pinoy Herbs.